I picked up Battlefield 1 two years ago to this day, and since then, have accumulated some 200 hours in-game. Over this time, I’ve seen the progression of the game from launch to the current day: after a smooth start, Battlefield 1‘s player-base tapered off with the limited progression system, and even as the various expansions were introduced, player counts remained lower than one would like. Even so, there remained no shortage of servers, and each successive expansion brought additional content into Battlefield 1. Constant updates from DICE has also served to fine-tune the game: player experience has improved with each update, and two years after its launch, Battlefield 1 handles very well. After Battlefield V‘s launch was announced, DICE has considerably stepped their game up, and the past few months have seen a superb amount of content, corresponding with an increased incentive to go back and play Battlefield 1 with frequency. 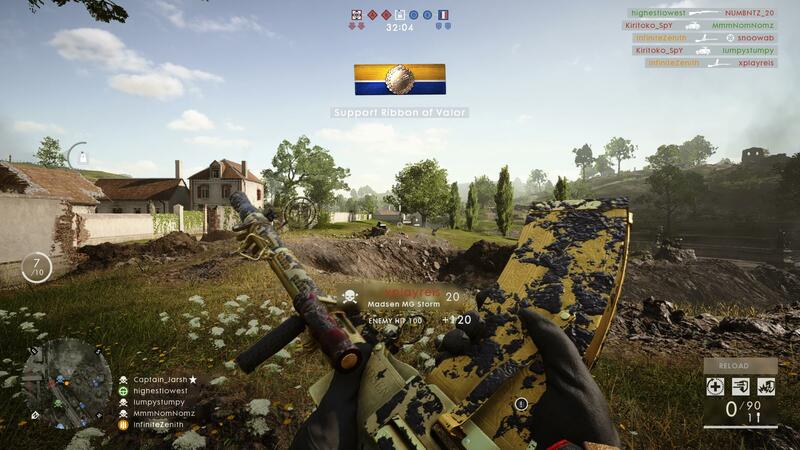 Whether it be the newfound means of earning scraps for purchasing weapon skins, or completing the Road to Battlefield V assignments to earn customisations, Battlefield 1 has simply been fun, for the lack of a better word. 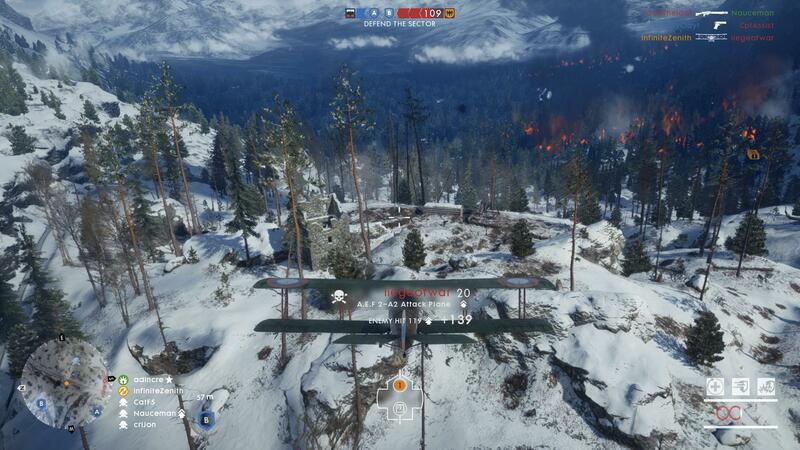 Coupled with DICE’s recent promotion by giving away Premium passes and DLC for free, the player count has surged, making it possible now to find players on any map. The end result is more people, on more maps, making it easier to find games and play through them to complete the various Road to Battlefield V assignments in good pacing as Battlefield 1‘s time is drawing to a close. Two years is a lot of time, and Battlefield 1 now stands as my most-played Battlefield title, ahead of even Battlefield 3. Over the time I’ve logged in Battlefield 1, I’ve seen and done some amusing things that I certainly never expected to pull off; the size and scale of Battlefield’s matches means that there is almost always something spectacular happening: whether it be single-handedly demolishing an enemy squad while pressing an attack, sneakily neutralising people trying to sneak onto a capture point with the M1911 suppressed or pulling of some JackFrags level carnage with the Iliya-Muromets, Battlefield 1 proved to be pleasantly entertaining. Of note, as per the title of this post, I’ve managed to score a Killionaire (ten kills, each within four seconds of one another, or ten kills within the space of forty seconds). This medal is counted as being very difficult to score under most conditions in Halo 3‘s multiplayer, to the extent where a clever song was made about the glory associated with earning a Killionaire. My Killionaire in Battlefield 1 came, unsurprisingly, from a particularly lucky bombing run on St. Quentin Scar: most of the opposing team was clustered around the ruined church, and I’d just spawned into the match. I switched over to the twin HE cannons after spotting the point, knocking out three players while softening the target up. When my HUD lit up with markers indicating enemy presence, I unloaded the payload on the target point and came out of it with ten kills. With this bit of skulduggery, I bypass the Killimanjaro, Killtastrophe and Killpocalypse medals (respectively, seven kills within twenty-eight seconds, eight kills within thirty-two seconds and nine kills within thirty-six seconds). 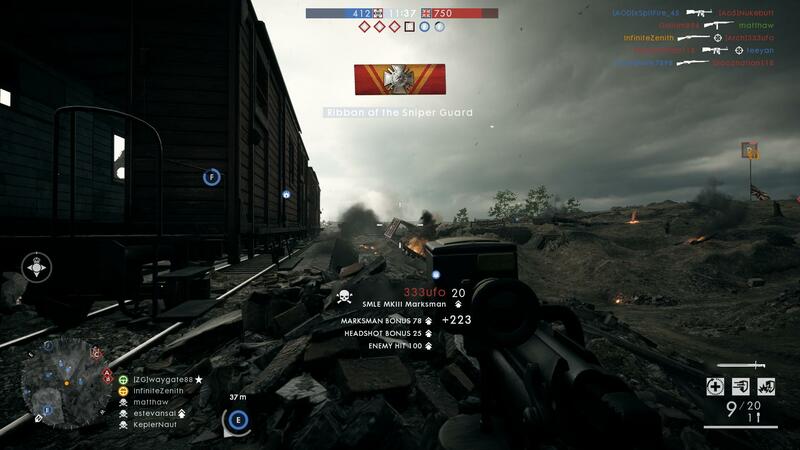 I’ve gotten quite familiar with how to handle the Ilya-Muromets and not crash it when taking damage, leading to me going on my longest killstreak in Battlefield 1: twenty in a row, corresponding with Halo‘s Rampage medal. I still remember when Prise de Tahure was one of my least favourite maps for players camping in the darkness, although with more than a year’s passage since the map’s release and my subsequent learning of the best paths to use, I’ve managed to evade camping players and so, have survived much better on this map as of late. Before delving further into this post, I remark that I’m not too sure if there will be reason to write about Battlefield 1 in the future. For the time being, readers will need to contend with one more Battlefield 1 post; this one features thirty screenshots and several of my latest exploits in the game. 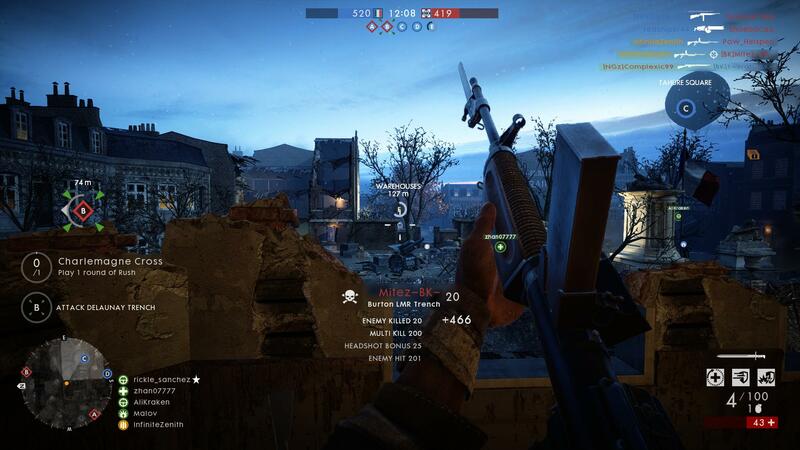 Late in its lifecycle, DICE added variable-damage fire-modes to the General Liu Rifle and M1903 Experimental: the General Liu gains a bolt-action mode that allows it to one-shot headshot, and this mode is surprisingly fun, giving the weapon a powerful long-range alternate fire. 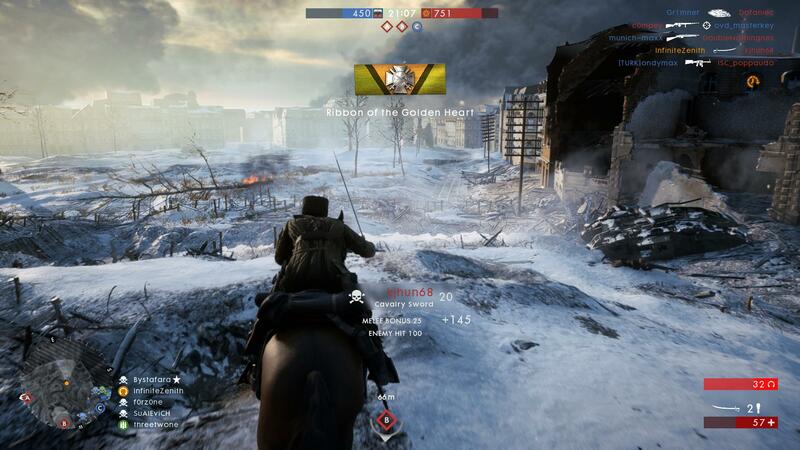 Readers following me since the days of when I first began playing Battlefield 1 will note that I had no screenshots of me on horseback, and even fewer screenshots of me on horseback doing anything useful. 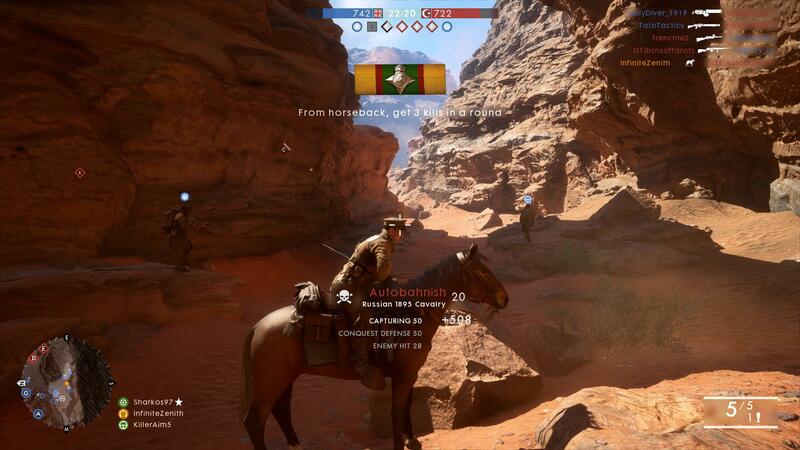 Horses in Battlefield 1 were a novel feature, being harder to control and manoeuvre to mimic real horses, but I never bothered putting in the time to learn them. However, I decided to give it a go again, and in a few matches, I’ve managed to use them to moderate effect. 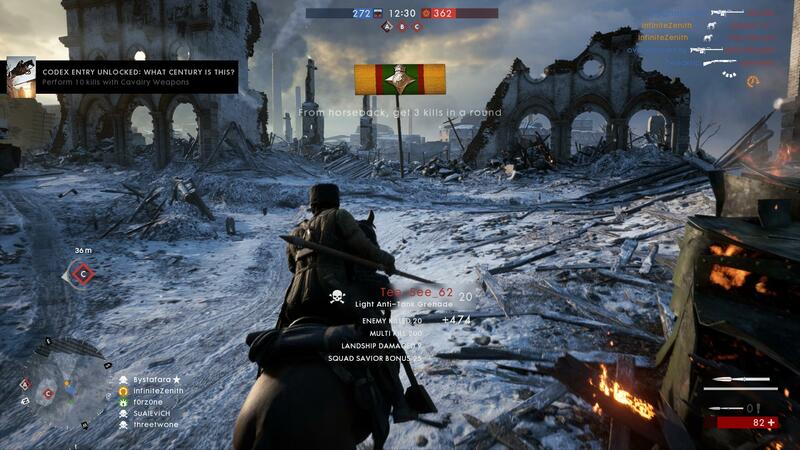 It was on Tsaritsyn where I earned my first ribbon for using the cavalry class. While the cavalry spear is an amusing weapon that can spear opponents, the cavalry sword is much more practical. Requiring long sprints to skewer enemies, I don’t think I’ve ever died to the spear before during my time in Battlefield 1. The main advantage of being on horseback is being able to dump health and ammunition pouches that quickly allow for a player to resupply and heal up. 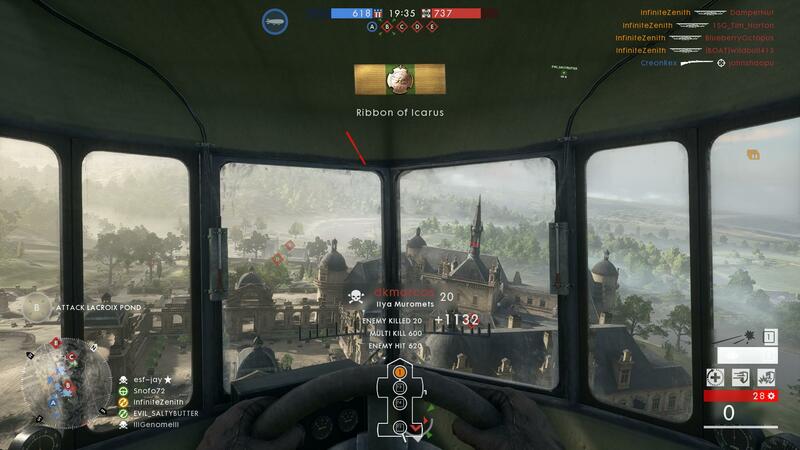 This is the screenshot that gives the post its title: during a phenomenally lucky bombing run on St. Quentin Scar, I flew over the ruined church and unloaded my bombs, taking out ten enemy in one go. To convince readers that this was indeed a Killionaire, my score earned in the screenshot for this feat is 2226, and by the time the indicator was through with calculating my score, I earned 2334 points. The blatantly overpowered Ilya-Muromets is the closest thing to a weapon in Battlefield 1 that could hail from Nidavellir: when properly operated, the plane is nearly invincible and can torment enemy teams unchallenged, hence the page quote. To put things in perspective, here’s a screenshot of me earning yet another Killtrocity on Ballroom Blitz: the score is a more paltry 1132, which is impressive but nonetheless pales in comparison to the bonus earned from scoring a Killionaire. These days, taking screenshots is much easier than it was before I had FRAPS: back in my Halo 2 days, I used Print Screen, which meant that I lost my first-ever Killimanjaro screenshot when the button failed to register the screenshot. At this point in time, the St. Chamond Assault Tank is my most-used tank: the handling characteristics and vehicle abilities makes this a particularly attractive tank to drive, and I’m surprised at how well it’s worked for me in combat. The disadvantage about this tank is that it’s less stable compared to the Mark V Landship and AV7 Heavy Tank; I can attest to this, having found myself stuck in unfortunate places that ended my kill-streaks with the tank. Besides incredible, Halo-style multi-kills, I’ve now become proficient enough with the planes so that I can stay in the sky for extended periods of time. When I first began flying the Ilya-Muromets, my inability to steer the plane meant I would end up crashing or exploding from going out of bounds, but having spent nearly three hours behind the wheel of one, I’ve come to love how it handles. During one Shock Operations match on Giant’s Shadow, I terrorised the other team, who began swearing at my presence in the sky. I spent most of that match in the bomber, and my best was a 20-streak, which comes very close to the 21-streak I got during the open beta with the FT-21 Light Tank. 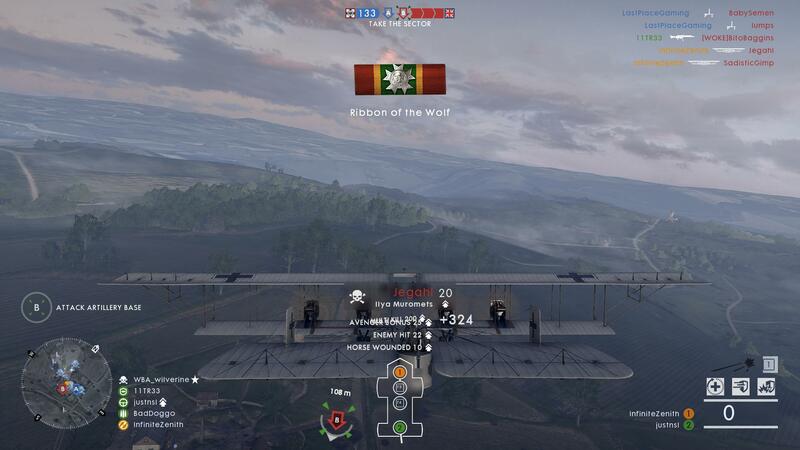 As the match progressed, a player going by the name of VictorYao03 got frustrated enough to take to the skies in a plane to try and shoot me down. The end result of this bit of skullduggery was that he would overheat his guns, and then attempt to ram me. I had full health, and after he exploded, I had just enough health to survive. At this point, I was far away enough from the fighting so that I could fly off into the distance, repair and then turn around to go for another run. 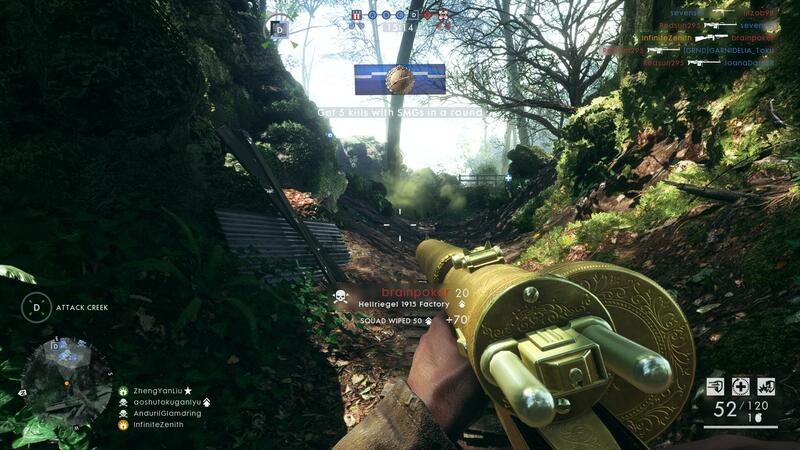 The Road to Battlefield V has given me access to some very flashy-looking legendary skins, including an ostentatious silver-and-gold skin for the Gewehr 98 that I’m rather fond of. 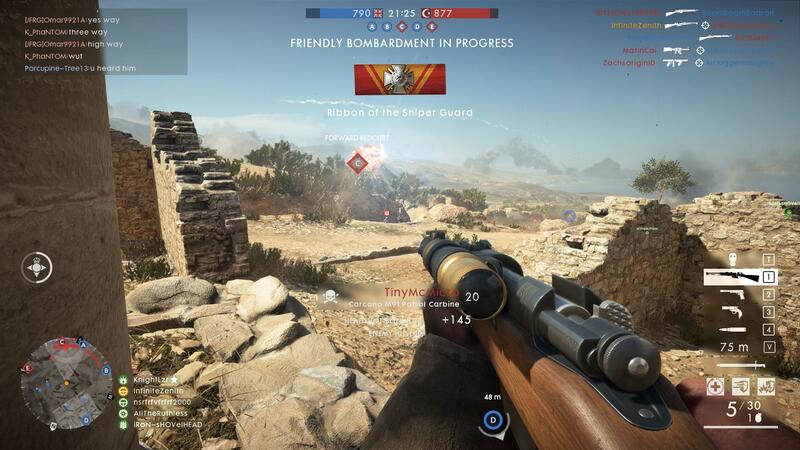 The Gewehr 98 is one of the best long-range options in Battlefield 1 for having the fastest bullet velocity, and of late, I’ve been using it a lot more for this attribute. It’s now my fourth most-used bolt-action rifle, after the SMLE Mk. III, Ross Mk. 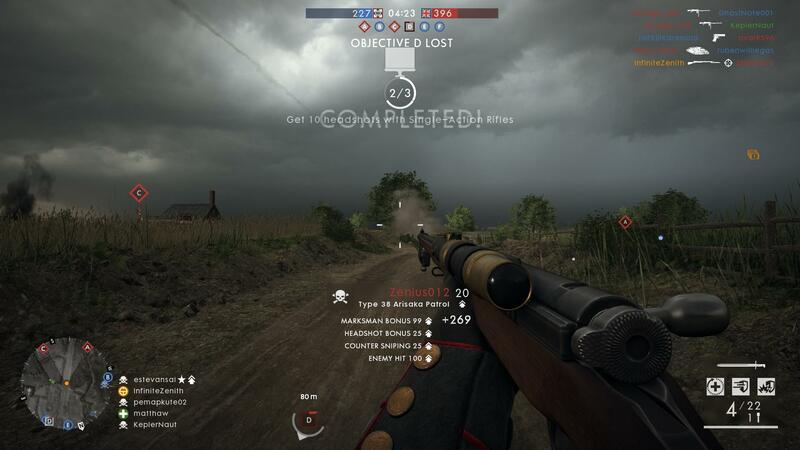 III and M1917 Enfield Silenced. Compared to the Russian 1895 Trench, the Russian 1895 Cavalry has a longer damage drop-off, faster bullet velocity and faster recovery, but more spread. It’s a tricky weapon to use, and in general, I usually use the horse to run folk over or rush in for sword kills, but at longer ranges, it can be satisfying to make this weapon work. I’ve actually not used the Russian 1895 series of rifles as a recon: they offer nothing particularly distinct, as the SMLE Mk. III and Gewehr 98 cover off the most effective usages for bolt action rifles (closer range aggressive sniping and long-range precision shooting). 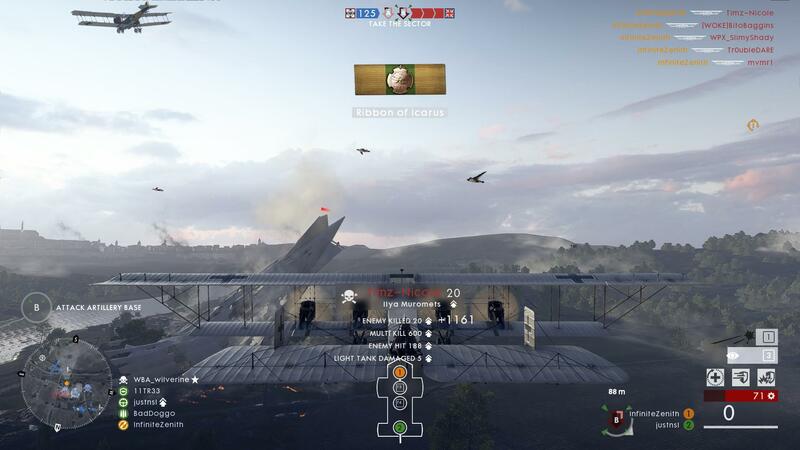 I’ve actually gotten skilled enough with flying now to score the occasional kill with a plane, although as with all previous Battlefield titles, flying and anti-air combat has never been my cup of tea. While smaller planes are much more manoeuvrable than the Ilya-Muromets, they also require more skill to track targets and use effectively. 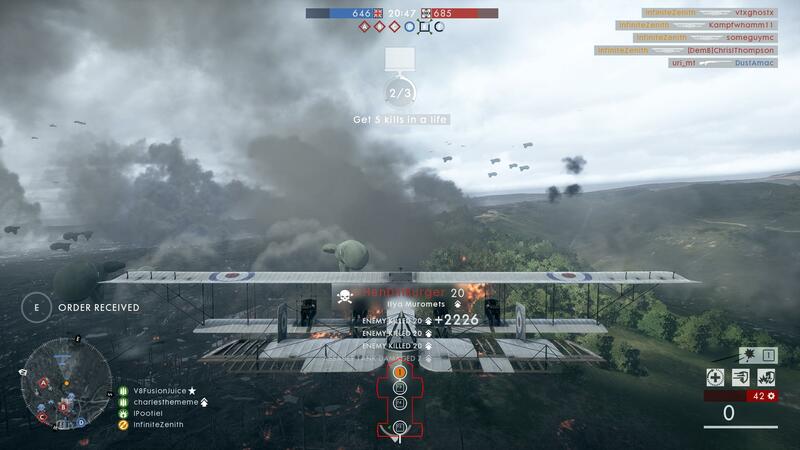 In my hands, it’s effective for strafing capture points and scoring the occasional kill, but in the hands of a skilled pilot, the attack planes become monsters capable of turning the tides for a team. Of late, I’ve noticed that traffic around these parts has seen upwards of a 30 percent reduction, and this curiously coincides with a spike in visitors reading a post I hosted long ago. This post deals with Tango-Victor-Tango, specifically with the community as it would have been when the post was written, and the post is unique in that it is the only post I have to have been written by a guest writer. This individual is, to use a trope, a friend of a friend, and I consented to host it to mix up the discussions. I am an occasional reader of Tango-Victor-Tango – some of the content there is interesting and can lead to interesting discussion, or else is absurdly wrong to the point where it can lead to interesting discussion. The individual who requested the article ended up providing a very comprehensive and personal account of their time at Tango-Victor-Tango, and with the spike of traffic in, my curiosity was piqued. I followed the referrals back to the source, learning that this individual was subsequently banned from Tango-Victor-Tango, but later circumvented the ban and continued to edit whilst keeping a low profile. I’ve not heard from them since, but this is not too surprising, considering that it’s been five years since they’d made the request to post the article. I would suppose that being patient would be the best way to defeat any sort of ban: people usually raise suspicion when they evade a ban and then return to their old habits immediately. As far as I’m concerned, I’ve not any malice for Tango-Victor-Tango in general; I pull their points out here and go to town on them strictly for amusement. From what I can occasionally find, however, this sentiment is not mutual, and the post I’ve had guest-written has attracted a non-trivial amount of hate. In response to this, I suppose if one really opposed that article, I’d be willing to hear them out, but the original author isn’t around to, and because of my policy against spam, I disable comments on all posts older than two years. Further to this, I’m not exactly big on drama, so folks looking to bring any over here will be disappointed. 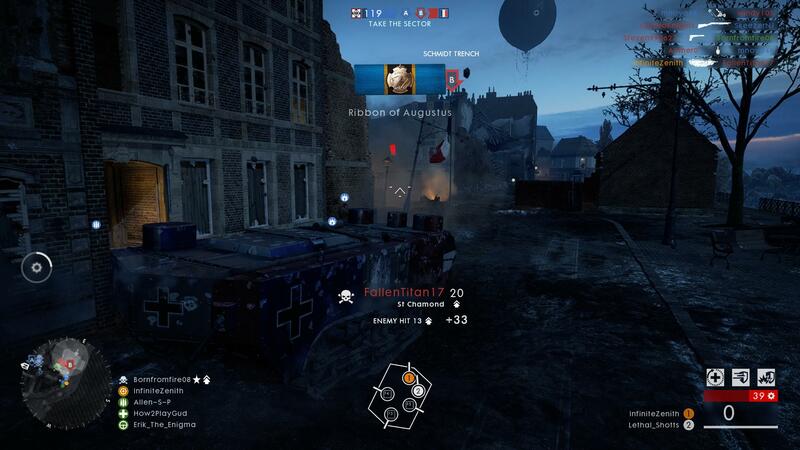 Back in Battlefield 1, I score a kill with the Annihilator Trench with a spectacular-looking skin. The “try-hard” weapons, alternatively known as the “comfort” weapons, are the weapons that I fall back upon while trying to score points for the Road to Battlefield V assignments. During those games, my goal is to amass as many points as possible and minimise the amount of time spent playing. 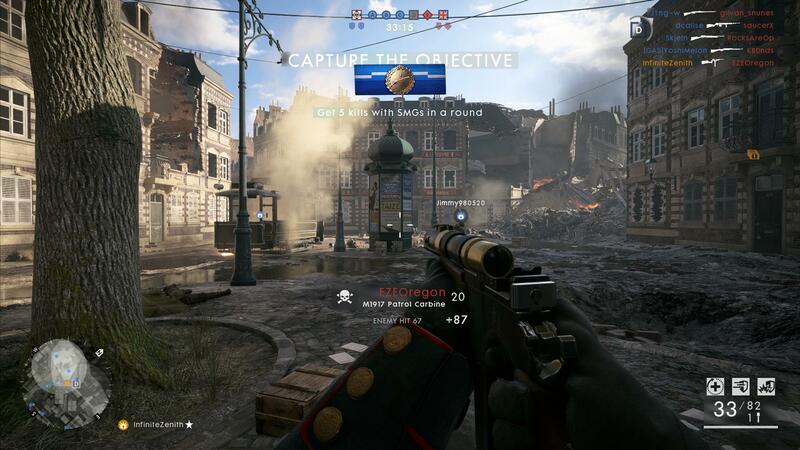 However, when I am not doing this, I’ve been exploring other weapons, such as the M1917 Patrol Carbine here. The only assault weapon with optics, it’s actually a fun mid-range weapon whose sights extends the reach of an otherwise limited close-quarters weapon. 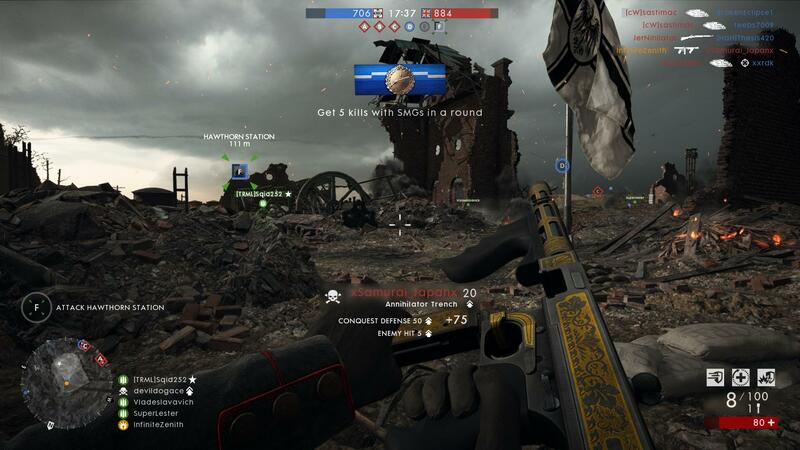 Some of the latest weapon skins are absurdly over-the-top: here, I’ve got the equivalent of a Golden Madsen MG, a legendary skin earned from doing Road to Battlefield V assignments. It’s been a very long time since I’ve seen Golden guns in video games: the last time would have been 007 Nightfire – in classic James Bond shooters, gold-plated weapons deal bonus damage. The legendary 4.2 mm Golden Gun from The Man With The Golden Gun is also present in some iterations of James Bond FPS, being able to kill with one shot and is balanced out with a single shot and lengthy reload time. It’s an iconic weapon, and I rather miss not having a good James Bond shooter in modern game engines. 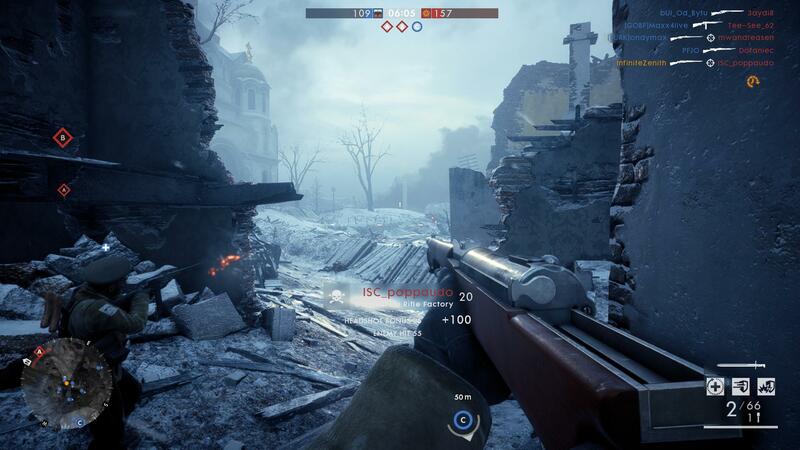 During a game of Frontlines, I decided to give the Carcano M91 Patrol Carbine a whirl: the base weapon is in between the Russian 1895 and Gewehr 95, with a good firing rate and reload speed. I’ve never been particularly good with iron sights, but having optics on this weapon makes it a viable choice for sniping. The Frontlines game mode is a rather interesting one, combining conquest with rush and thanks to an influx of new players because of the Road to Battlefield V promotions, it’s finally nice to be able to play in modes other than conquest. 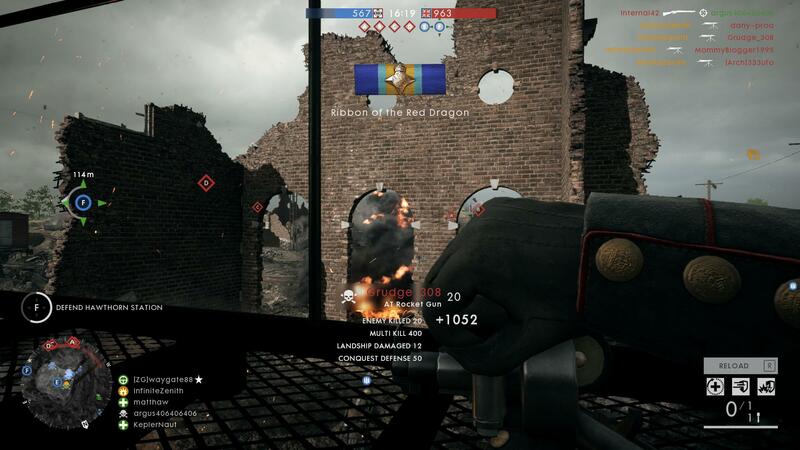 The Ribeyrolles 1918 is one of the weapons in Battlefield 1 that handles like an assault rifle: hitting harder per bullet and with a slower firing rate, but also reduced recoil and spread at range, it’s suited for some medium range engagements and handles well enough in close quarters. The quest to unlock this was a brutal one, and I have an inordinate number of kills with the MP18 Optical as a result of trying to unlock this weapon. 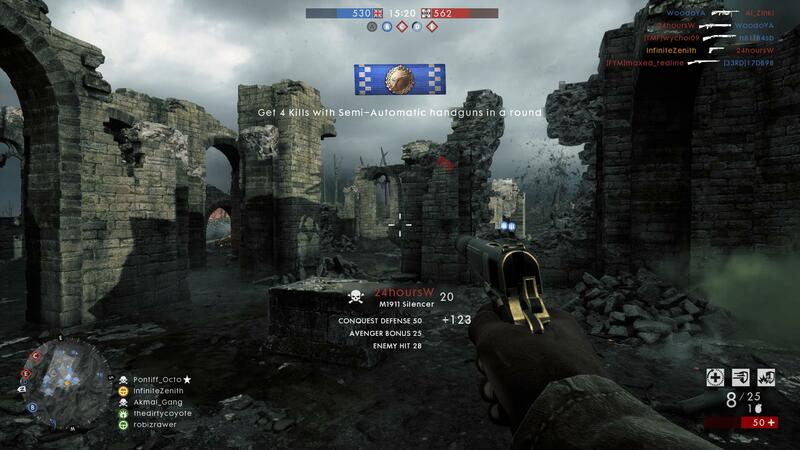 The Golden Hellriegel is pure bling, and here, I use it to swat a certain “brainpoker”, a nuisance of a player who spent an entire match acting as though he were twelve. After I took him out here, he proceeded to spew slurs into the text chat about my anime emblem, and then rage-quit when it became apparent that my team was going to win. I never did get this behaviour, and Battlefield V looks to curb players such as these by introducing a mechanism for suppressing all expletives and profanity, although the side effect is that simple curses are also suppressed. The Tour of Duty medal is perhaps one of the easiest to unlock, requiring little more than playing as each class, in order, for ten minutes. 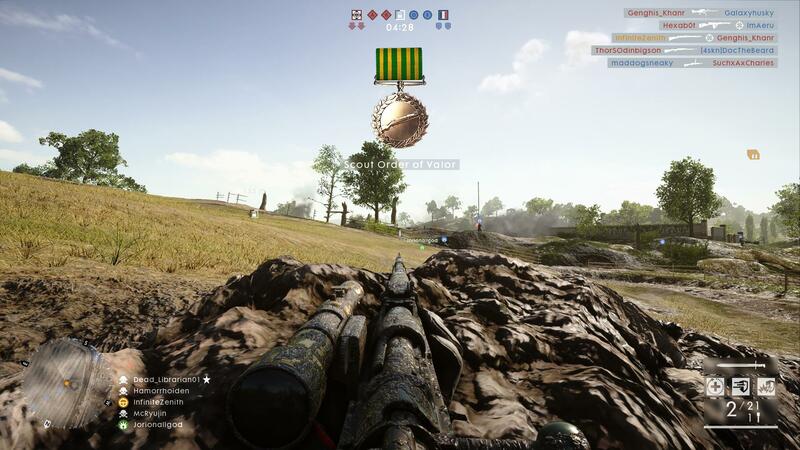 If I intend to screenshot this medal, I will usually attempt to get nine and a half minutes on the sniper class, then either spawn into a new match or go somewhere quiet to earn the remaining time required. 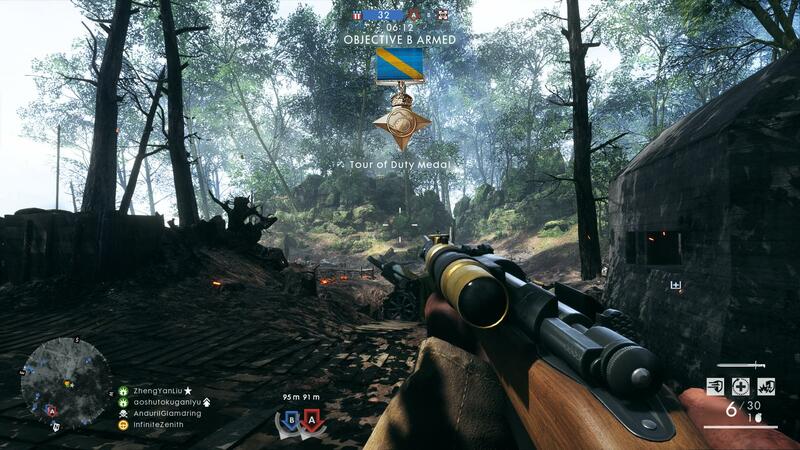 This match of frontlines on Argonne Forest was a hectic one, and so, I stuck with the assault class until near the match’s end, when I was more confident that my teammates had cleared enough of the map out so I could get the remaining seconds for the medal. Over the past few weeks, I’ve had an inclination to snipe, and it suddenly strikes me that as of now, I’m about as comfortable with a bolt action rifle as I am with the sub-machine guns of the assault class. For Battlefield 3 and Halo 2, I performed moderately well in both close-quarters and long ranges, but in Battlefield 4, I could never do well with a sniper rifle. 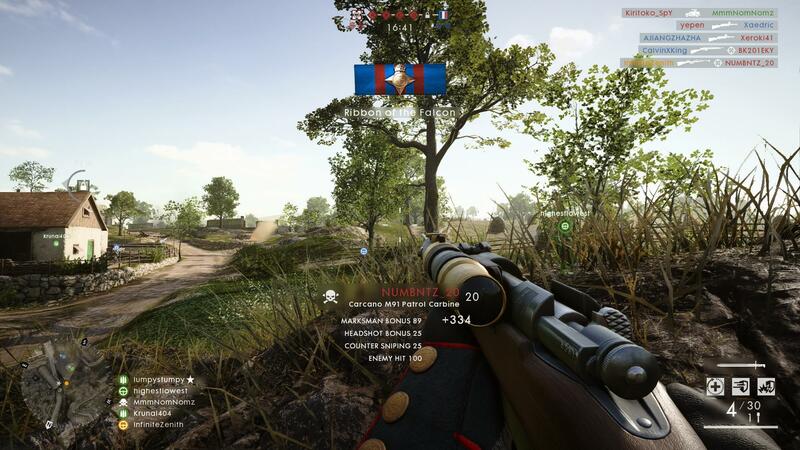 Battlefield 1‘s sniping system was very satisfying, and by now, I do not utilise the sweet spot mechanic as a crutch, instead, choosing my rifle purely based on whatever my inclination for the day is. 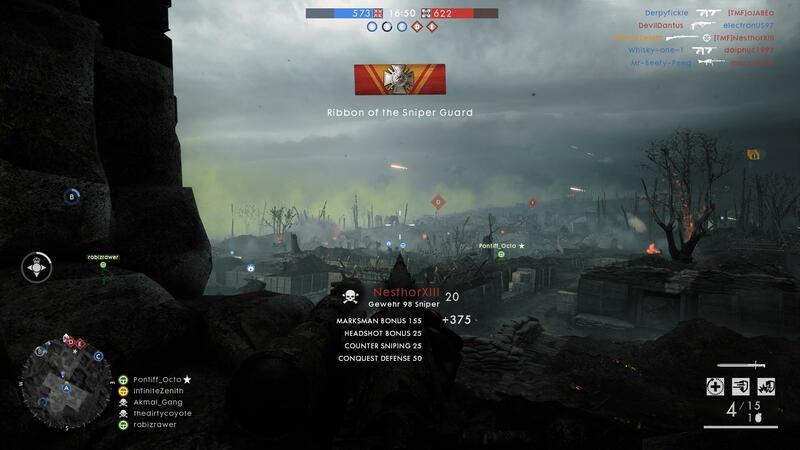 It is immensely amusing when players low on health take on burning damage from the flare gun and I get a kill out of it – apparently, the Frostbite Engine counts deaths to flare guns as an explosive kill, landing me a ribbon for explosive kills. I’ve long held that the artillery truck is for unsportsmanlike players who have little inclination to help their team out and instead, play only to further their own personal statistics. Weakly armoured but giving drivers to a powerful array of weapons, artillery trucks are used by those who would farm kills and not contribute to the team. I derive immense satisfaction from destroying these. On maps where there is the option, I prefer running a tank, since it also acts as a mobile spawn point for team-mates and has enough armour to help with a push. 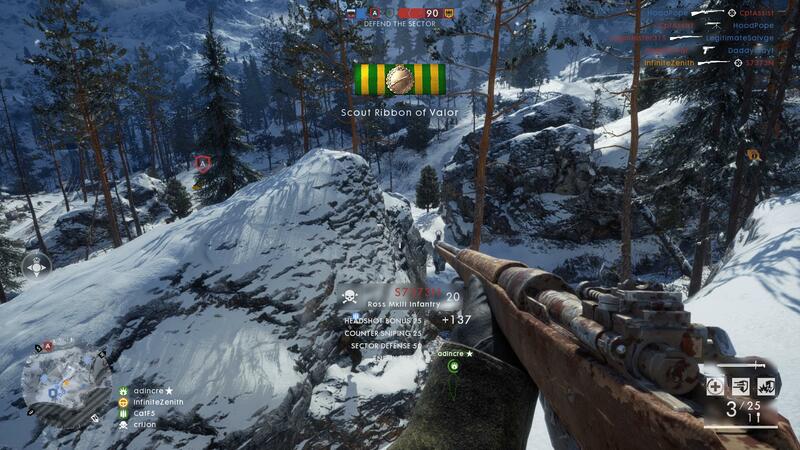 Both the patrol versions of the Type 38 Arisaka and Carcano M91 Carbine are excellent weapons: I’ve not had too much success with the iron-sight versions of either, and even with the scope glint updates, sniping has not been too difficult: if one could get a flank on players, they won’t be telegraphing their presence, allowing for sniping to remain viable even though the marksman optics now have glint. On the other hand, the updated scope glint mechanics have been useful in helping me avoid snipers who were in their sweet spot: seeing rainbow glint forces me to duck away. 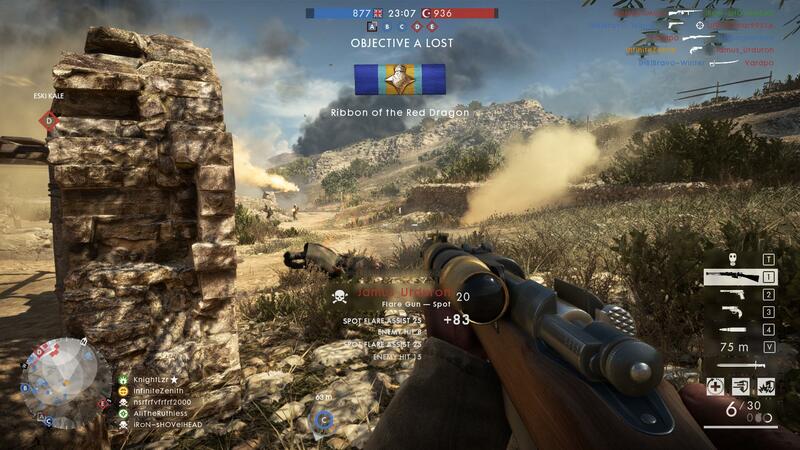 Towards the end of last week, one of the medals on rotation was the Scout Order of Valour, which involves making use of the bolt-action rifles in combat. Getting twenty kills with the weapons and ten headshots is not particularly challenging, but the final goal, to get five kills in a life, was tricky because I struggled to stay alive in between kills. It took a better part of a Saturday afternoon to find a match where I could not be flanked, and in the end, it turns out that Frontlines is better for staying alive as a sniper compared to Conquest. I decided to take a break from sniping and focus on the tanks that were maligning my team. Towards the end of the match, a Mark V crept close to one of the flags, and I managed to destroy it: I was hiding behind the rubble on a raised platform, keeping me out of harm’s way while I reloaded, and for my troubles, I ended up with a Killtacular. 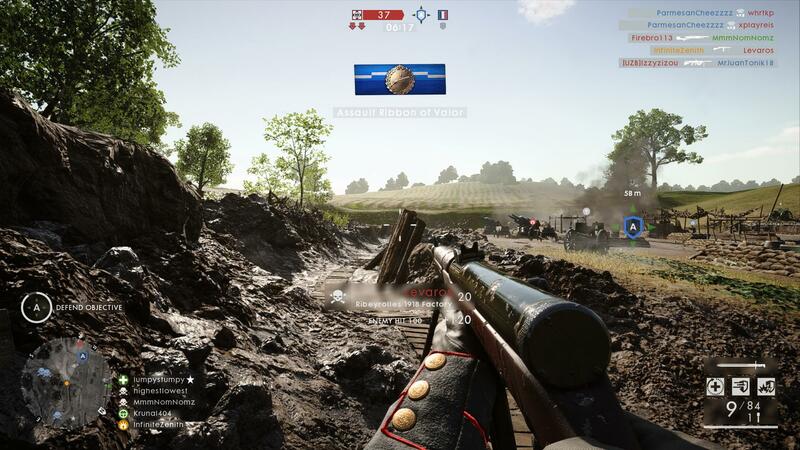 The next map on rotation was Passchendaele – I imagined that the more linear nature of the map and the usual tendency for chaos to be centered around the brave, charlie and delta flags, would make the map a good place for sniping from alpha. I ended up being semi-correct with this supposition: I ended up reaching four of five kills on several occasions, but the other players caught on, trying to flank. Here I attempt to fend off players with the M1911 Silencer, a nice addition to the game that provides a quieter option. A group of four players had snuck onto alpha flag, and I ended up dispatching three, but the last one took me out. As a result of trying to snipe from alpha, I ended up with a bunch of headshots and no 5-streak to show for it. In spite of this, it was still fun, and I reiterate that I don’t particularly worry about winning or losing a match, so as long as I’m having fun. When the match ended, I left and sought out another environment to play in; recalling that Frontlines was very linear and did not provide much opportunity for flanking, I decided to look through the servers for Frontlines. In the end, I managed to get the medal, and with this, my post comes to a close. The post title itself comes from Dagashi Kashi, mirroring the mish-mash of content episodes cover. 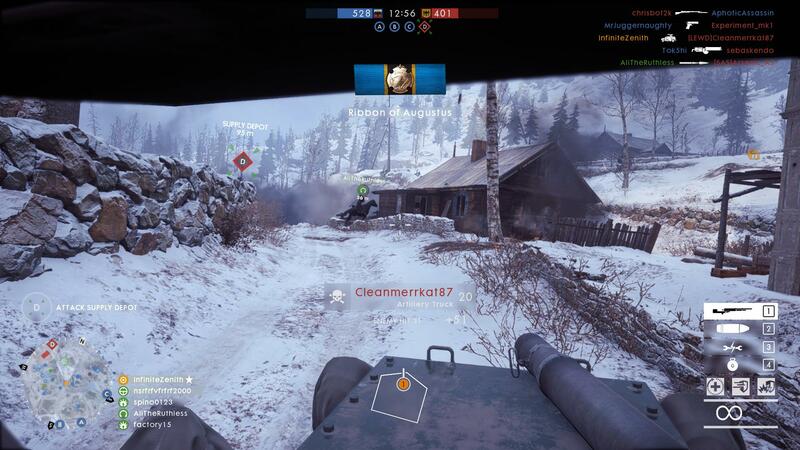 A year ago, I was thoroughly enjoying the content that In The Name of The Tsar provided, and now, two years into the Battlefield 1 journey, I admit that I will be sad to see the support for this game stop, as well as for the inevitable decline in player count as folk migrate over to Battlefield V. In the meantime, there is at least one more week of Road to Battlefield V activities, and I am sure to make the most of things while Battlefield 1 still has players. For my readers, who invariably do not like my gaming posts, my next anime-related posts at the start of November will be for CLANNAD ~After Story~ and The World in Colour. Finally, tomorrow is Halloween, translating to me looking forwards to my tradition of enjoying leftover chocolate while watching It’s The Great Pumpkin, Charlie Brown!. Battlefield 1 has provided a very incremental experience that allowed me to see the process of a Battlefield game from launch until the end of its support; I had bought all of my previous Battlefield titles on sale, well after the game’s support cycle had ended, and so, was playing a finalised product that was unlikely to see new changes or updates. 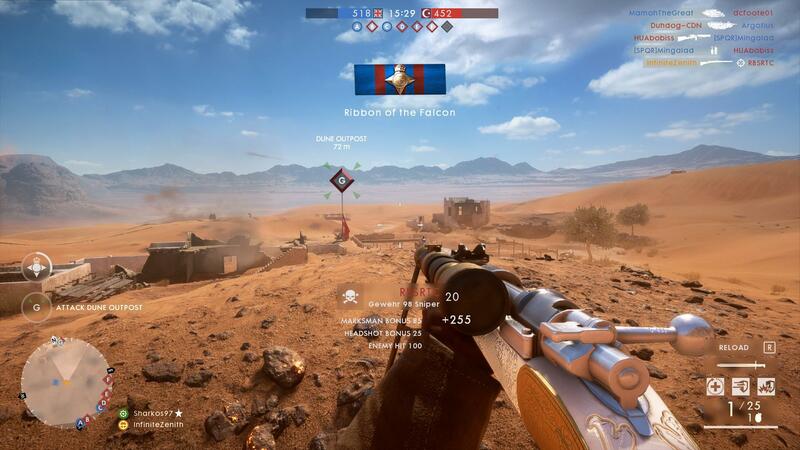 By comparison, being able to see how DICE handled Battlefield 1, and adjust to the new changes, was a new experience for me. The changes, for the most part, took only minimal adjustments; I was not blown out of the water by the updates and adapted promptly. 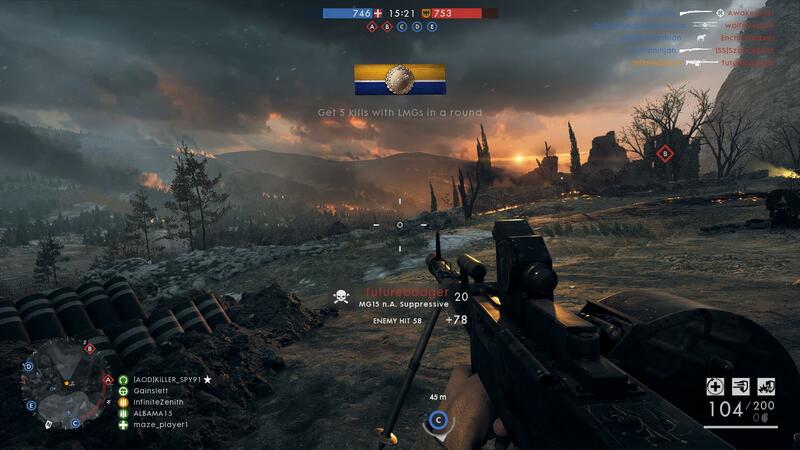 Overall, I feel that of the Battlefield titles that I’ve gone through, Battlefield 1 has many of the best gameplay mechanics and performance: movement is very smooth, and shooting feels satisfying for the most part, with my only complaint being random bullet deviation. The progression system, however, was very limited, and Battlefield 3 had the best progression system: there was enough content to keep players occupied, but it wasn’t overwhelming. However, towards the end of its life-cycle, DICE was able to create incentive for players to return to Battlefield 1 through its weekly missions and daily assignments. While the changes did come later, they provided motivation to return, and so the sum of these items together mean that Battlefield 1 was definitely a solid addition to the franchise. I am impressed that DICE was able to present as much content as they did using the World War One setting, and the game has definitely gotten replay value from me. Looking ahead to Battlefield V, I presently am still on the rocks about it: one one hand, I had a fantastic time in the closed alpha and open beta, and things handled very well. However, the lack of launch content, and a campaign with only four missions means that I’m cautiously optimistic about Battlefield V: I will wait for more details following Battlefield V‘s launch before I make any concrete decisions as to whether or not this game merits a purchase for launch price.